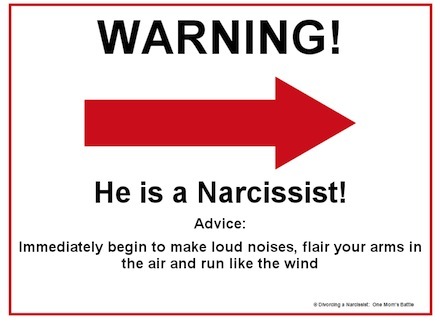 This morning I saw a guy wearing a t-shirt that said: I come with a warning label. It instantly brought back memories of sweet chuckles that my friend R and I had over this idea, you know, something like an up-frontal disclosure of key issues, assuring safe handling and prolonged harmony, like for example: handle with care, tends to wrinkle and bend out of shape when challenged or stretched; has been burnt in the past, apply stain and pain remover gradually; sudden exposure to rejection could cause an irreparable ego tear etc. While poking fun at character warning labels can yield some serious belly laughs, the whole idea of people’s “damage” disclosure to me actually feels completely wrong. If I only think back at how much I enjoyed getting to know and exploring the full spectrum personality traits of my friends and family, or how deeply immersed and interested in every aspect of my newly found friend’s personality I was, or how much I learned about myself and others through fearless exchange and exploration of sensitive subjects, or trigger spots, or the idea that people can bring the good, bad or ugly out of you, or how it’s also all a matter of perspective, how we evolve, heal deep personal wounds over time, how we shed baggage, and lose triggers, or simply change attitudes, then the idea of being forewarned on all those counts spells out a rather dull, ignorant and boring human existence. 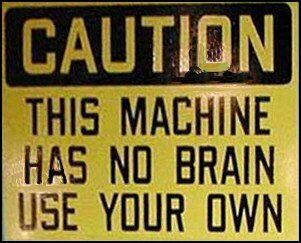 Besides, most warning labels, are pretty much useless if you ask me. I grew up in the Balkans, where most common warnings come in a form of your loving, caring grandma and her ever ready, old country wisdom, wrapped in copious amounts of superstitious folklore, that went to backward stretches of absurd warnings like not to balance your chair on 2 legs, because you’ll never get married, or don’t laugh when you eat or drink, or your husband/wife will be crazy; or don’t leave the knife with a blade up, there would be conflict in the house; knock on the wood or spit out if misfortune is mentioned in the conversation; close the windows, the air draft will get you sick; don’t drink all that water, it’s not good for your kidneys?! The list of baseless, superstitious absurdities goes on and on. But, when it comes to real, serious warnings, where I come from, they are almost non existent. For example, if you visit any of plentiful historic sites, ruins, old castles, forts, city walls, no matter how high you climb, or how long and deadly your fall could be, there are typically no hand rails, fences or warning signs anywhere. You are often left to explore bravely, at your own risk, relying exclusively on your better judgement and instincts. I never bought into superstitious fluff. So to feel reasonably safe, I learned how to rely on a combination of intellect, experience and intuition, trusting some form of self guidance. It actually makes me feel more equipped to fearlessly conquer any proverbial height in life, no handrails or warning signage needed. I feel that the beauty of conscious, raw life is in the discovery of the unknown, not in guided tour with a training manual. 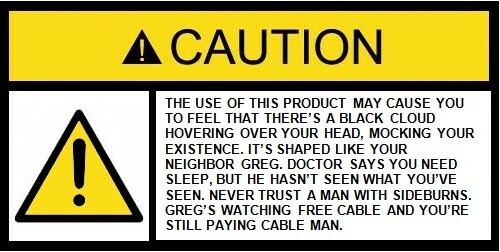 So when it comes to people coming with warning labels, my vote would be a categorical NO!